After evening Mass today I was invited round to a family home in the parish for a delicious plate of roast lamb, and fun conversation with a group of youngsters who are, one-by-one growing up and leaving the nest for university. As a secular priest, living on my own in the parish, outside of the Sacred Liturgy, I usually say my prayers on my own. It is therefore a joy to share prayers with a family occasionally. When I was in Camberwell, the renowned Fr Hugh Thwaites SJ once spoke to the youth group. They were mainly of Irish families and he asked them whether they said the Rosary together as a family. Some did, some didn't. He pointed out that if they did not, they were probably the first generation in a thousand years to abandon this practice. 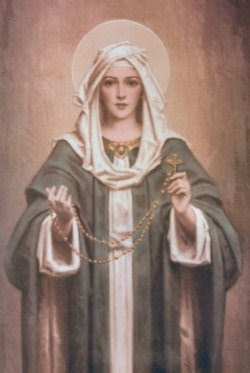 The Family Rosary is a most powerful devotion which brings many blessings on parents and children. The devil hates it and will do anything he can to stop it. When visiting families, I never leave without giving a blessing, normally using the Visita quaesumus prayer to ask for the protection of the holy angels. If you have a priest visit your home, always ask him to bless your home and family. It is a grace for you, given ex opere operantis ecclesiae, that is to say, fortified by the prayers of the whole Church, since it is an approved sacramental. It is also a good reminder to the priest of why he is there in your home. He may be a friend, he may like to share food and drink with you, he may tell good jokes (or not, as the case may be) - but his principal place in your home is as a priest of Jesus Christ.